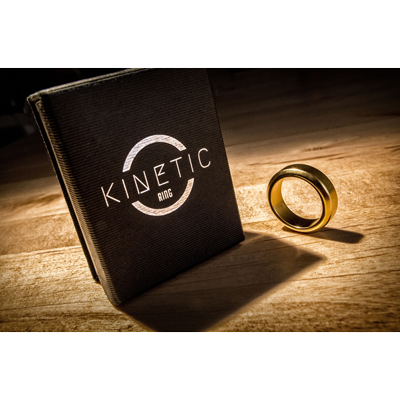 The Kinetic Ring is a staple in magic that has now reached a next level of evolution & engineering. Constructed from an original, single neodymium rare-earth magnet, and expertly disguised as a sleek comfort-fit band. Turn a fashion statement into a devastatingly effective magic device that you have ready, anytime. No one knows you have an arsenal of magic right on your finger. Hide your secret in plain sight. Murphy's Magic acquired the rights to the original famed Wizard PK rings from the late Jim Trainer. We proudly re-engineered it to give the magnet 25% more attraction power while making it more resistant to impact if dropped. The Kinetic Rings should be a cornerstone of any magician's toolbox as it allows you to have a universe of magic, all in one self-contained ring. Available in two styles: Curved band & Beveled band. Comes in three colors: Black, silver & gold. Eight proven tricks & routines. Shipped in a complimentary storage & gift box.